Probably the best skiing area in Iceland. Great slobes for experienced riders as well as for those who are not as experienced. You can rent all the equipment on site, just come and we'll take good care of you. 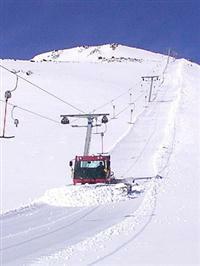 For nearly 40 years the mountain Hlíðarfjall has been one of the prime skiing areas of Iceland. The hallmarks of Hlíðarfjall are high quality snow, extensive cross country trails and exciting ski slopes with breathtaking views of Eyjafjörður. Akureyris ski resort is situated just 5 km outside of the town, it is a very unique area. The elevation of the site goes from 500 m to 1000 m above sea level and so there is plenty of opportunity for good skiing during the winter months. Since 2006 Hliðarfjall has had a number of snow making machines installed which extendes and improves snow conditions on the slopes. All of the main runs are floodlit, allowing evening skiing.